The holidays are intense. For those of us who celebrate – or who are shoehorned into celebrations – it gets hectic. We are barely staying afloat – balancing family responsibilities, meal-planning, travel and party arrangements – while struggling with all the regular bill-paying, job-holding, schedule-wrangling stuff we are used to. Many of us are celebrating Thanksgiving – or some form of communal meal – this month. My suggestion for this very quick sew-along is to carve a little space to sew something cozy. Whether you are making this for a friend or your own enjoyment – a holiday gift or something warm and snuggly for yourself – this is a relatively quick project but a satisfying one. 1. 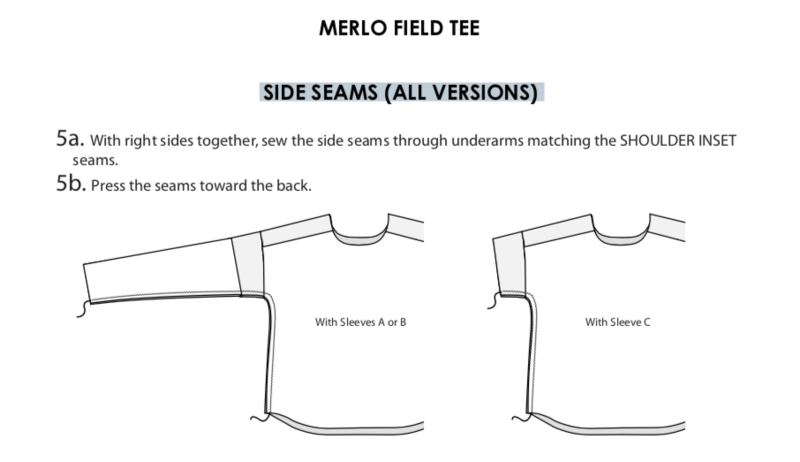 The Merlo Field Tee is pdf-only, and it is $12. This means you can buy the pattern and get it in your inbox RIGHT NOW, no waiting! In addition to the pattern cost, you will be paying for printing (whether at home or at the copy shop). 2. The size range is bust 31″ to 47″‘ and hip 34″ to 50″; it has a loose fit result (check the FINISHED MEASUREMENTS table toward the end of the post). This is a VERY easy pattern to grade, and includes lines for lengthening/shortening. I will talk more about what grading is in the next post. For now, don’t worry about it! 3. The pattern comes in several different printing options – you can print at home or at the copy shop (I use pdfplotting.com for my printing needs). It also prints in layers, which is perfectly delightful. For a project like this, I typically order a pattern with all the sizes, plus layer copies of whichever discrete size I need right away. For a pattern I know I love and know I’m going to use often, I often print a copy of each size, and carefully label and hang them. Most cotton lycras and rayon spandex will stretch to that degree. Most french terry, stretch velvet, ITY, and jersey will stretch enough. So while almost any stretch fabric will work with this, check for that 25%. If you’re buying online do make sure by reading the fabric description or asking the supplier. Let’s talk about how *much* fabric to buy! And finally – before we acquire and cut the fabric, I want to in include one more footnote. 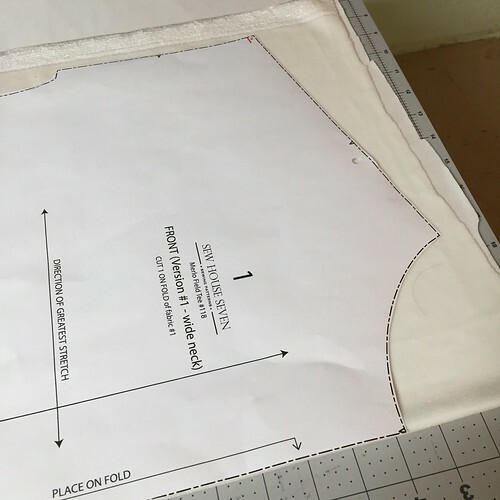 This pattern includes a handy table that includes the finished garment measurements. This is a great option if you have a favorite shirt, and you want to make the garment in a similar size. 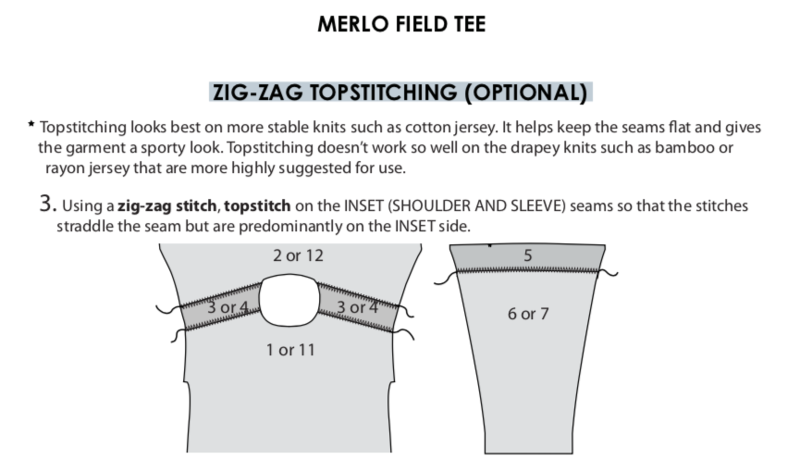 Please keep in mind when comparing to your favorite top that a dolman-style sleeve – as the Merlo Field Tee is – is going to fit differently than a set-in or raglan sleeve garment. 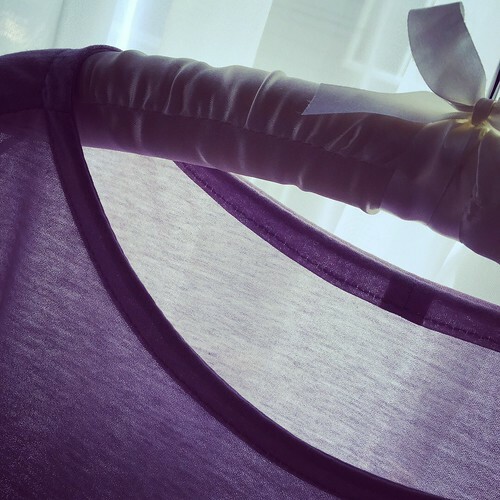 Also, different fabrics will drape and stretch differently – which also affects your experience of fit. That said, the FINISHED GARMENT MEASUREMENTS table is very helpful, and just another reason I really like Sew House 7 patterns. They are very thorough in their instructions, illustrations, and diagrams. 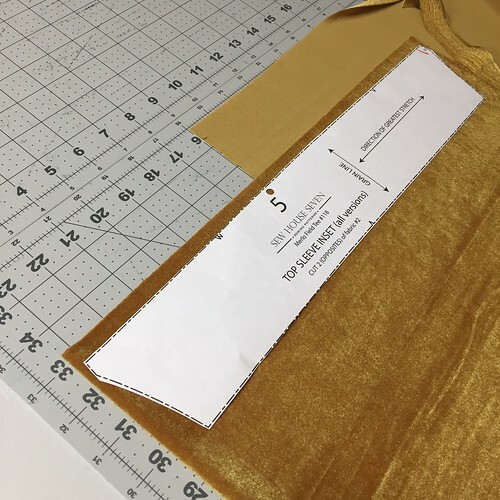 The pattern also contains a full glossary of different stitches and techniques we may want to employ (page 4), and gives a general outline for the project as well as the seam allowance of 3/8″ (page 5). 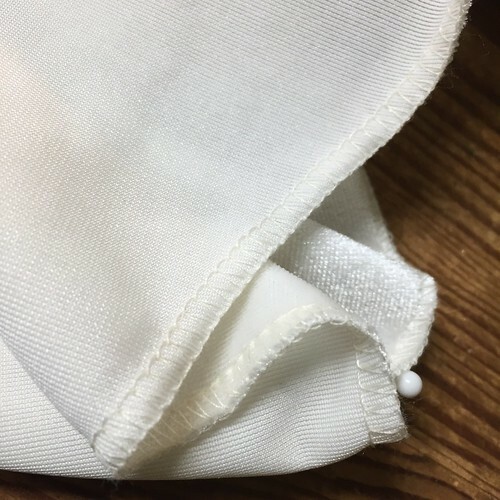 For most of my construction, I first stitched on my home machine, using a 2.5 mm long stitch at .7 mm wide; then I serge-finished, leaving long tails (which I will demonstrate and explain later). 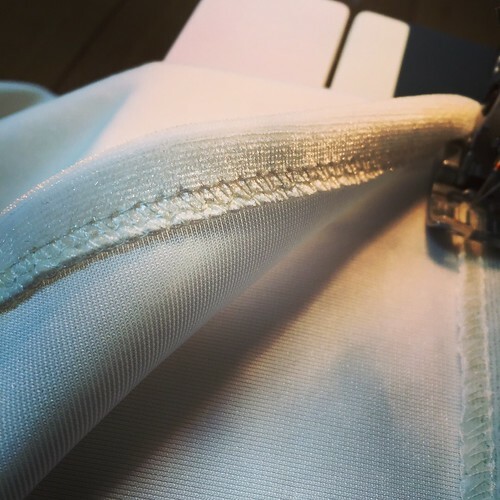 Some will want to serge-only – but I like the control that machine-stitching affords, which is why I sew most knits with the machine first. 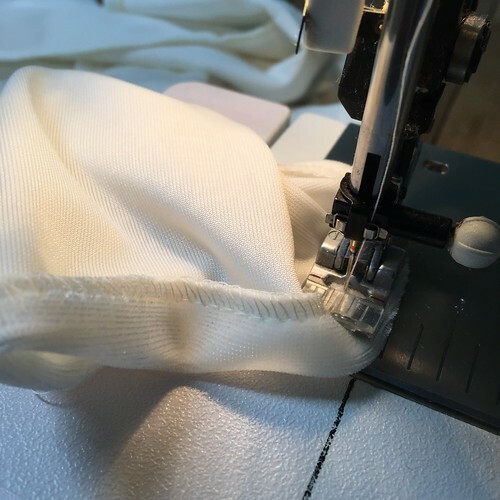 If you don’t have a serger, that’s okay! 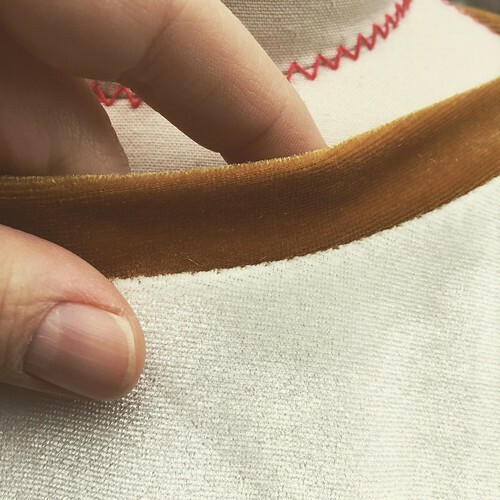 For most construction seams you can simply zig-zag and then finish with another zig-zag 1/8″ from the stitching line. 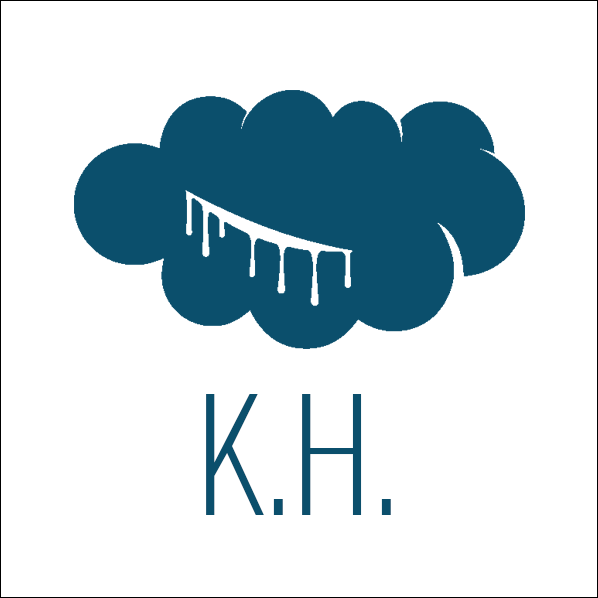 If you are newish to sewing knits or unsure, please do test on scraps first. And if you have any trouble, add your pictures and questions to this post! 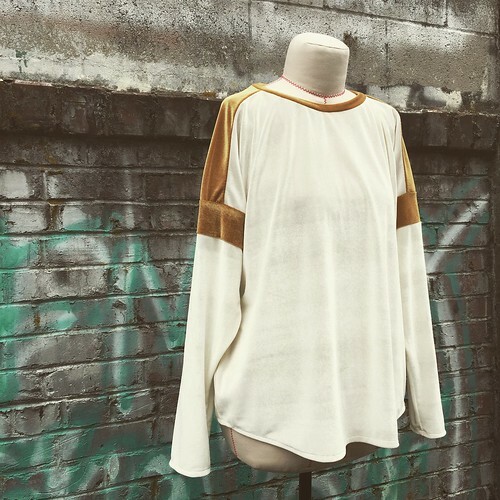 After cutting out the two large body pieces (front and back – pieces 1 and 2 for the wide neck and pieces 11 and 12 for the crew neck) and the sleeve or sleeve band (pieces 6, 7, or 8 resp. ), we can set aside our main color fabric. 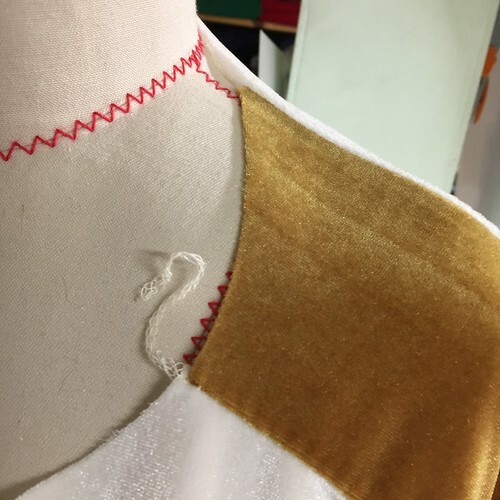 Now it’s time to cut those little accent colored pieces: the shoulder inset (piece 3 for the wide neck and 4 for the crew neck), the sleeve inset (piece 5), and the neckband (piece 9 for the wide neck and 10 for the crew neck). You know one thing that’s so darn cool about this pattern? 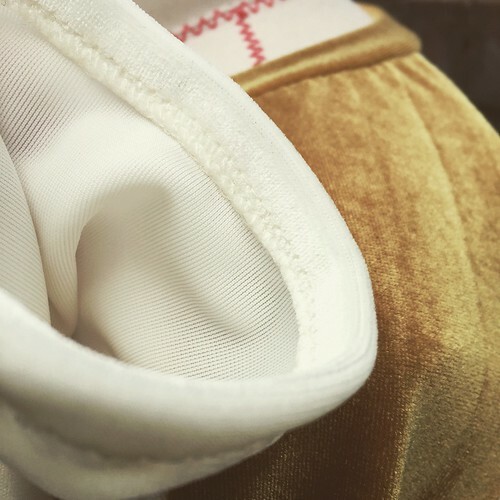 The very subtle curves in the seam, at the shoulder inset. 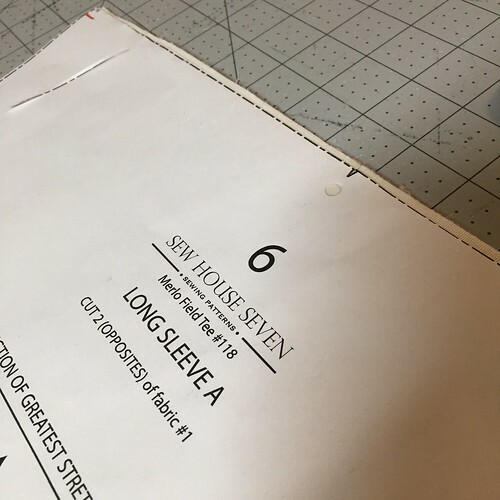 Don’t worry about it, but the fact these sleeve pieces are gently curved is just one reason I love the exacting nature of the Sew House 7 patterns. As you cut these contrast pieces, you are probably noticing how little fabric they use – perfect for scrap-busting, no? There you go – about forty percent of the work of this t-shirt, is already finished! Now, pin and stitch the back shoulder inset to the back body, just as above. From here on out, all seams except the sleeve and body hem, will be constructed the same way! In a similar fashion, complete the sleeve inset! These next steps – 2a and 2b on page 9 – are completed for the full-length and 3/4 sleeve. 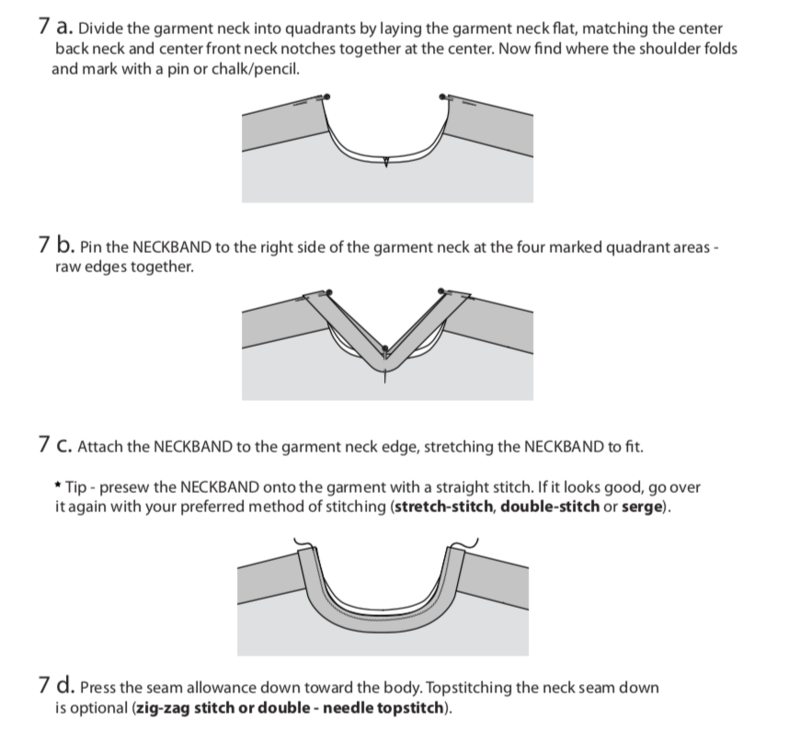 For the short sleeve, omit this step and stitch the short ends of the sleeve band (piece 8) together, as per instructions on the bottom of page 9. We will soon be stitching the short ends of the neckband together, in the same fashion. Back to the long-sleeve or 3/4 sleeve versions: the sleeve inset is shaped like a rectangular trapezoid. Sew the shorter of the long ends to the top of the sleeve (page 9), and finish and press just as you did for the shoulder seams. Next, the pattern indicates an option to topstitch the inset pieces, before adding the sleeve. This is entirely a personal choice! Definitely practice on scraps first. 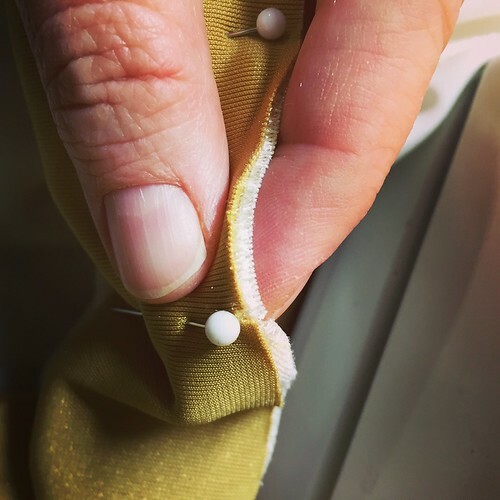 Topstitching on knits can add a high-end touch, but you want to make sure you have your tension and stitch length correct! Finally, sew the top of the sleeve (with the inset color) to the body of the shirt, right sides together and notches matching (page 10)! We are almost done: only the side seams remain. Go ahead and finish the seam in your preferred manner. Can you believe it? We have finished everything except the neckband, and hem. 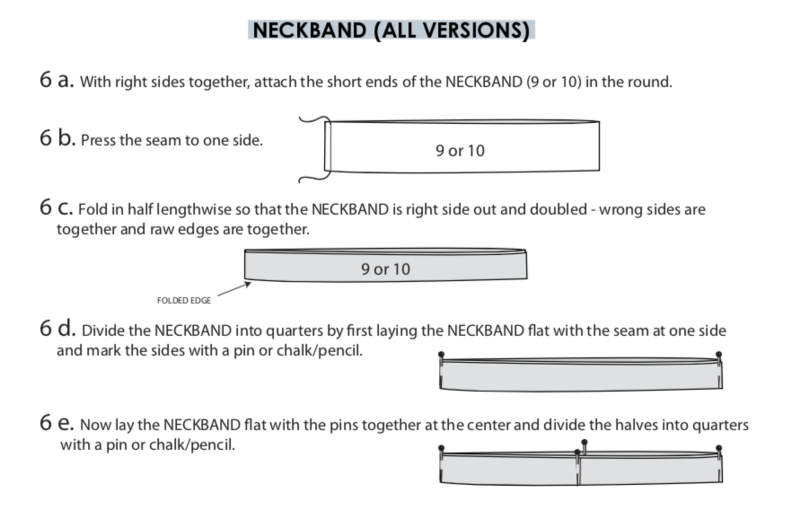 So when affixing that neckband – again, take your time. really pin as evenly as possible before basting or stitching. The neckband is the most visible part of the shirt, and getting it just right is a real confidence-booster. Honestly, the look of a great neckband is simply divine! Time for our sleeve and garment hems! So, for most cases, I like to serge finish the edges, as it gives me something to hang onto when I stitch the final fold. 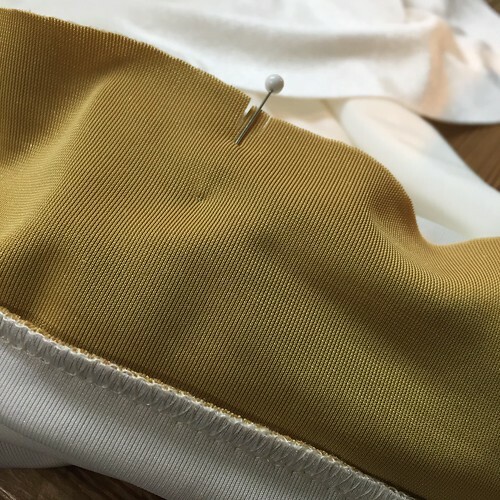 But if you don’t have a serger, don’t finish the edges by zig-zag; it will hinder more than help. Take your time, and press the hem up (as per top of page 13). Really patiently press, and get that curve looking lovely. Pin with scissors, if need be. Now as I say, that serge hem allows me to fold by hand, as I sew! However this is sort of a years-of-experience thing. If you don’t find this easy, go ahead and press that hem as the directions imply. And finish accordingly on the sleeve hems! 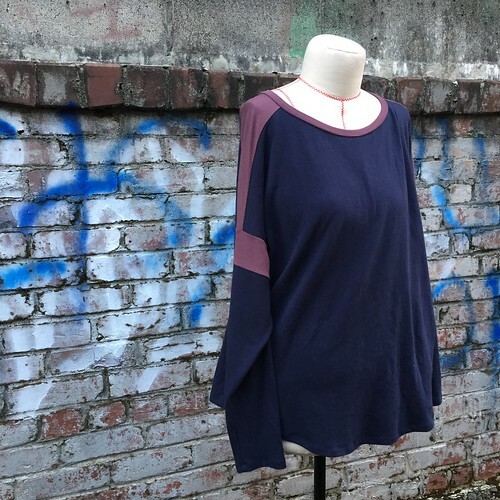 For both the hem and sleeve hem – go ahead and give a light pressing! And that? Is pretty dang awesome! Hello R! You are correct – if something lacks spandex, for this particular project, it also lacks stretch! This is true whether it is made of silk, cotton, rayon, or polyester. I have found looking up “stretch velvet” yields a lot of great results. 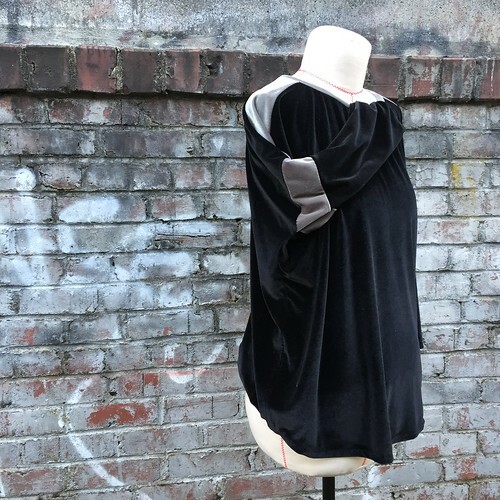 “Velour” can be either knit or woven, and can have stretch or no-stretch – sadly, it’s not really a standardized description. 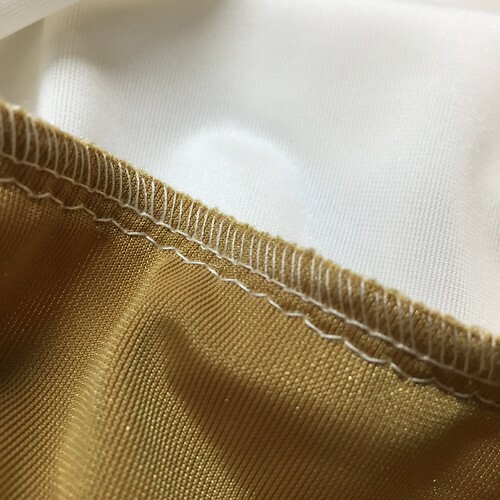 If the fabric description online doesn’t say anything about stretch, either contact the seller or move on. You can also ask local (meaning UK, since that seems to be where you are shopping from) online sewing groups for leads.